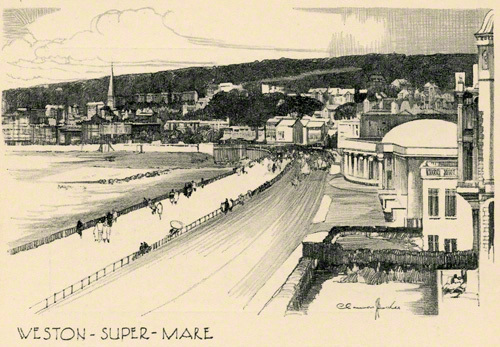 Claudes Buckle's view of Weston-super-Mare shows the North Parade to the Pavilion in the Royal Parade. The pencil sketch is nearly identical to the poster of the same name. Weston-super-Mare is a seaside resort, town and civil parish in the unitary authority of North Somerset. (2013) Weston-super-Mare is a great seaside resort with all the traditional seaside attractions, including our famous donkeys! Created in 1935.